A plan to photograph the historic lunar locations with NASA's new Lunar Reconnaissance Orbiter (LRO), revealed yesterday on SPACE.com, should be a boon to lunar archaeologists who aim to solve some longstanding mysteries and also get a historic-landmark designation for the Apollo 11 touchdown site. 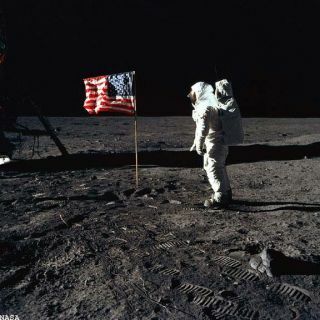 The first moon landing by the Apollo 11 crew took place July 20, 1969. The new photos, expected in coming days, weeks and months, will be of keen interest to archaeologists involved in the Lunar Legacy Project. They contend that Apollo 11's Tranquility Base should be seen as an anthropological site and deserves preservation for all present and future inhabitants of the Earth. "Even after our research, I still think we don't know exactly what is on the Tranquility Base site and how it is placed," said Beth O'Leary in the Department of Sociology and Anthropology at New Mexico State University in Las Cruces. O'Leary created the NASA-funded project to make the Apollo 11 Landing site on the moon as a National Historic Landmark. The idea of cultural resource management in space is also highlighted in a new book, "The Handbook of Space Engineering, Archaeology and Heritage" that she co-edited with Ann Darrin of Johns Hopkins University Applied Physics Laboratory in Laurel, Maryland. What is the condition of Tranquility base after 40 years? Was the American flag blown over on the Eagle's ascent and is it now a bleached skeleton? What are the relatively long term effects of the lunar environment on human artifacts? All good questions, O'Leary pointed out. "We need to know where our material culture resides on the moon. Many parts and pieces of our time, certainly in the era of the early robotics on the moon, are missing from the database," O'Leary told SPACE.com. Although the process of taking high resolution images is intensive and costly, O'Leary said, the possibility exists to locate humankind's lunar leftovers precisely, assess their condition and most importantly decide then what and how to preserve this record for future generations. "We have a chance to assess the totality of our time on the moon so far and plan for the future now," O'Leary concluded.